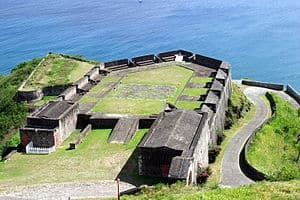 The French invasion of Saint Kitts also known as the Siege of Brimstone Hill (19 January – 13 February 1782) was a siege of the American Revolutionary War. 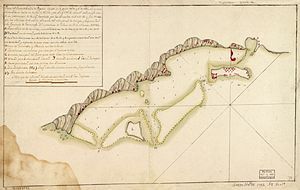 After landing on Saint Kitts, the French troops of the Marquis de Bouillé stormed and besieged Brimstone Hill, and after a month of siege the heavily outnumbered and cut-off British garrison surrendered. The Comte de Grasse, who delivered de Bouillé’s troops and supported the siege, was outmanoeuvred and deprived of his anchorage by Admiral Hood. Even though Hood’s force was inferior by one-third, de Grasse was beaten off when he attempted to dislodge Hood. Hood’s attempts to relieve the ongoing siege were unsuccessful, and the garrison capitulated after one month. About a year later, the Treaty of Paris restored Saint Kitts and adjacent Nevis to British rule. De Grasse set sail from Martinique, reaching Saint Kitts by 11 January. The British had already retired into their stronghold under Brigadier General Fraser, so the French landing forces disembarked without opposition and began to besiege them on January 19. Concerted with the Governor, an attack upon Barbados was mounted. Foiled in the attempt by the violence of the trade-wind, they turned to leeward against Saint Kitts. On 24 January, twenty-two British warships under Admiral Hood were sighted near Nevis intending to reinforce Saint Kitts. De Grasse went out to intercept then, but by dawn the next day Hood had veered towards Montserrat, and contrary east-southeast winds impeded the French from reaching the British before they had circled north around Nevis and dropped anchor off Basseterre. De Grasse attacked the anchored British fleet on both the morning and afternoon of 26 January but was beaten off, disembarkation proceeding apace. During these naval engagements the French suffered 107 killed and 207 wounded, compared to 72 dead and 244 injured among the British. On 28 January the 1,200-man British vanguard advanced against the town of Basseterre under General Prescott while its French occupiers fought a delaying action under Colonel de Fléchin with 274 men of the regiments of Agenois and Touraine until the Marquis de Bouillé could hasten reinforcements across the island. Prescott’s drive was eventually repelled, but otherwise French efforts continued to be hampered by the loss of their field artillery in a wreck while approaching Saint Kitts and the capture of an ammunition ship by one of Hood’s frigates. The governor sent artillery and ammunition to Fraser which were intercepted by the inhabitants, and by them deliberately made over to the French. 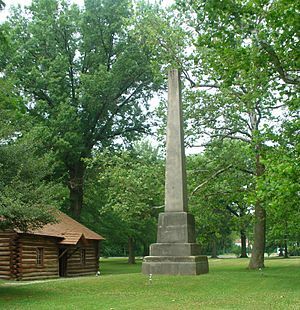 Defending the fort at Brimstone Hill were the 1st Battalion of the 1st Foot (approx 700), flank companies of the 15th Foot (approx 120), Royal Artillery detachment, and many militia. By 12 February Fraser’s little garrison, having lost over one hundred and fifty killed and wounded, besides many men out of action through sickness, was exhausted. 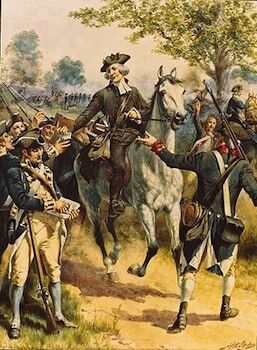 Additionally, there were breaches in the walls, and many of the militia petitioned to surrender. Fraser had no alternative but to negotiate a surrender, which included marching out with the honors or war. The next day, de Grasse ventured to Nevis to meet an arriving convoy of French victuallers, while Hood availed himself of the opportunity to escape in the opposite direction on the morning of 14 February.